Setting goals can be overwhelming. Short term goals, long term goals, goals for your personal life, goals for your professional life, all of it. It can be hard to know where to start and it can be hard to know what to focus on. One thing that can help you in your process is to observe how other people set goals. Read about their processes and then piece together the parts that suit your own needs until you have your own process. Don’t expect it to be perfect the first time or even the next few after that. Like any good process, effective goal setting takes time. Just do your best and remember: goals are fluid and they can be changed at any time. Before you list out your goals for the upcoming year, spend some time reviewing the year that is ending. Think about what you learned from your trials and your wins, and what you want to take with you from those experiences going forward. Then, start out thinking about the year in a broad sense. Answer this question: If you get to the end of the year and only accomplish three things (in any area of your life), what do those three things need to be? If nothing else gets done during the whole year, due to illness or changes in your life, or any other number of things, what are the three things that need to happen in order for you to consider the year a success? They don’t have to be big goals. They don’t have to be goals that take the whole year to accomplish. They do have to be specific, however. Maybe one of the things you want do in 2017 is grow your business. That is a great goal. However, there are a lot of smaller goals related to getting to that point. Ultimately, you will have to decide what “grow my business” means from a measurable standpoint. Hiring 3 employees is a specific goal. Increasing your net worth by 5,000k is a specific goal. Launching a 50% campaign over labor day weekend is a specific goal. For your top three goals, think specific. Next, spend some time thinking about what an amazing year would like like in all areas of your life and write it down. Don’t be afraid to dream big. Write down all the thinks you would like to accomplish in the upcoming year. All the thinks you would like to have happen, even if you don’t think they will. All the things that would let you say, “Wow, this year was the best one yet” come next December 31. Now it’s time to narrow those goals down. Create categories that fit the major areas of your life, and then include one for “long term goals”. You might have things further away on your horizon that you can spend some time working towards during this year. Goals don’t have to be one-year specific. 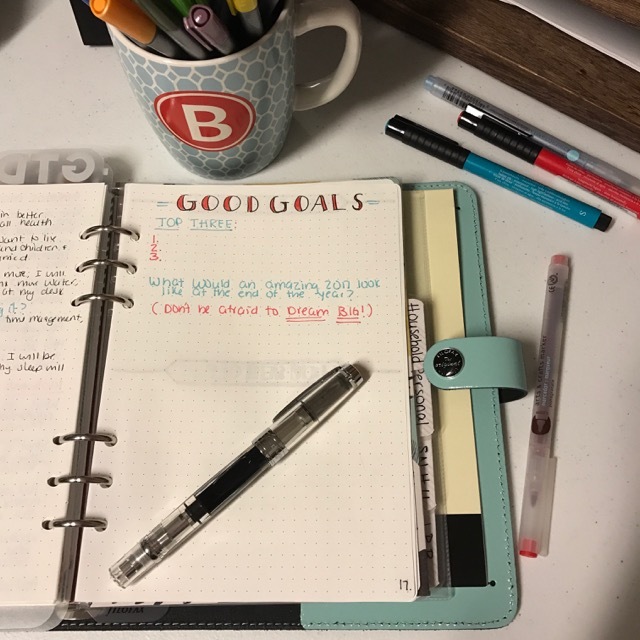 I narrow my goals down to three categories; personal (me only), household (including my family), and writing (which includes blogging and social media). You’ll notice I don’t have any work goals on my list. That is because I keep my work goals seperate and at work. This helps me leave work where it belongs: at work. Once you have your categories created, begin to pull out the goals you listed out on your brainstorming page and plug them in to the right place. Don’t worry about goals that don’t belong in any of your categories. We’ll get to those in a minute. Now take a few minutes and look at what you have listed with a critical eye. Are there any goals that are unrealistic? Maybe they are goals that you want to work on, but not this year. Think about creating a “someday/maybe” list and putting them on there so you don’t forget about them. Are there goals that on your list that perhaps belong to someone else? Make a note and have a conversation with them about what you’ve uncovered. Are there goals that are missing from your list? Feel free to add them on. Look at what you have left on your brainstorming paper. Are they goals or dreams? Can you create goals out of them and move them into one of your categories? Do they need to go on a seperate page to be given more thought? Do they belong on your “someday/maybe” list? They were important enough to write down. Don’t discard them without spending some time really thinking about what you wrote and why. Finally, think about choosing a word to guide your year. Read back through your year end review. Is there a word that keeps appearing in the pages? Think about the goals that you are setting for the year. Is there a word or a theme that gives them a focus? Is there something you want to work on aside from your goals that could help you choose your word? Is there a word that keeps appearing to you as of late that now that you are thinking about it seems like it would be a good focus for the next year? Spend some time thinking about it and see where the idea takes you. Then brainstorm some ways to incorporate that word into your year. Don’t be afraid to set goals that are outside of your comfort zone. Have a safe and happy New Year. I know it’s not the beginning of the year, but I’m hopping over here from Friday shares on Hope*writers and I found this post. 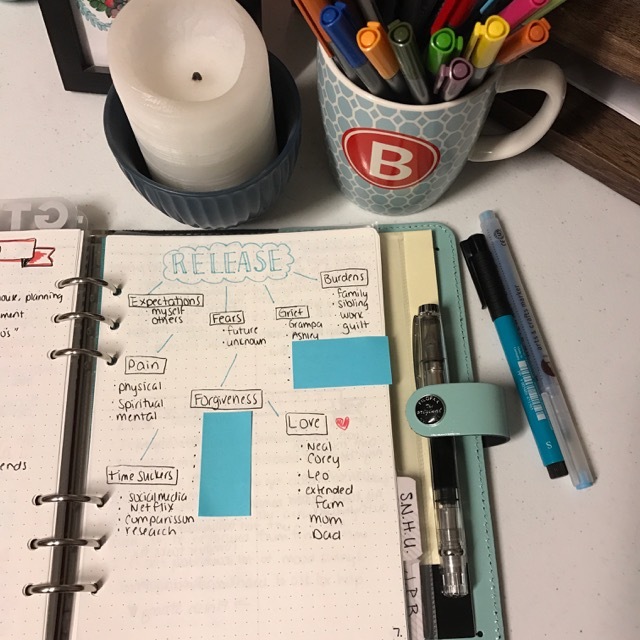 Someone had shared with me about bullet journaling and I was intrigued. You have such a great set of visuals here! I can’t wait to get started on bullet journaling myself! 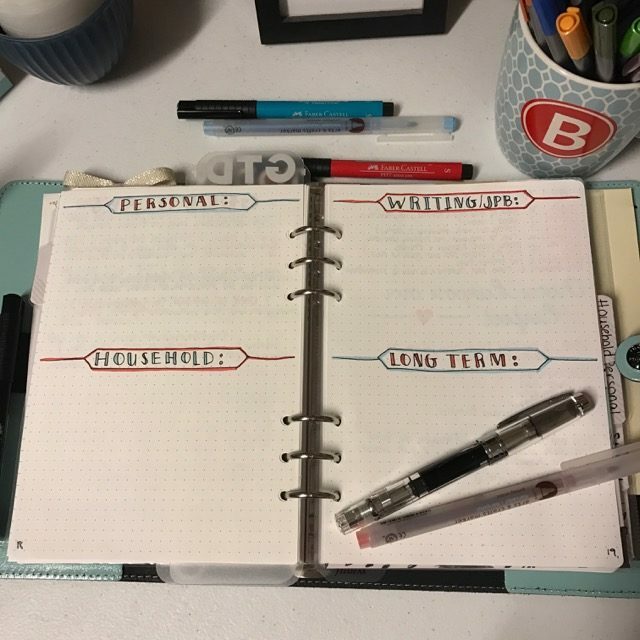 Kathleen, the best part about bullet journaling is that you can start any time you are ready. There are no pre-printed pages that make you feel guilty for all those months you didn’t have it together. Thank you for reading and commenting. Let me know if you have any questions I can help answer.